Creating an eclectic style for your interior is a wonderful idea. It’s not only easy to love; it’s a great design that’s a sight to behold if and when it is done right. However, an eclectic style interior is a bit tricky to achieve. Mistakes most people make when setting up this style is they believe it symbolises a jumble of textures, colours, patterns, and a mish-mash of unrelated pieces of furniture. Not so! Though the decor style is a combination of styles and periods using various items, old and new, most homeowners desirous of the look are way off most of the time. 2. You don’t have a focal point. Your curated look must not lack direction and focus. There must be an eye catching feature . . . A fireplace, elaborate wall art, or a conspicuous decor item like a mask on the wall. 3. You forget the room is not just a showroom. Because you have to live in and feel snug and comfortable in the space, let utility and functionality inform the way you decorate. Think of how you intend to use the interior space first. This way, you’ll chose items that will help you pull everything in the space together. 4. You tend to be inconsistent. An abrupt change in style of the adjoining spaces or rooms will make the interior look disjointed and disconnected. Ensure there is a smooth flow; each room must complement one another. Eclecticism must be reflected throughout the home's interior, subtly or elaborately. 5. You don’t have a unifying colour. There must be one throughout the theme which pulls the whole eclectic look together. This is also referred to as your "go to" colour and serves as an equalizer. 6. Your overall look lacks balance and your scale is wrong. There must be a balance in symmetry and scale and the total look must look organised. It is true that with the eclecticism, there are different styles from different eras just as textures vary but this is no reason to sacrifice organisation for diversity. 7. You believe anything goes because it’s meant to be eclectic. Not so. Avoid making everything look like a random choice. It tends to create a busy and cluttered look. Not only that, it will be distracting. Rather, make sure you don’t have too many contrasting styles in one space as it may end up looking like a mess. 8. You are too reserved. With eclectic interior decoration, you don’t have to be conservative. Fact is that you can't! This interior style is made up of a good number of decor items, fabrics, textures and patterns. If for instance you have a plain sofa and chairs, 'eclectic-up' with accent items like colourful throw pillows, paintings, area rugs, objects d'art, accent chairs, animal prints, and tapestry. 9. You compare hues and tones as a line-up on the walls. Avoid sampling colours you like on the wall lest you get confused and become indecisive. Rather, sample the colours you like on individual boards and look at them individually before making your final choice. If you can try to avoid these common mistakes and use them to guide your interior design task, you will successfully bring the eclectic style together and create a wonderful look. 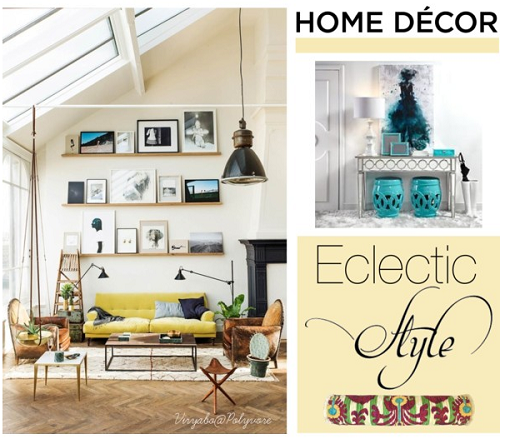 Eclectic style, when it’s well conceived, highlights your bold and unique taste and broadcasts the confidence you have in your own special interior decor style.